Babblings of a Mommy: How To Spring Up Your Winter Wardrobe. How To Spring Up Your Winter Wardrobe. I don't know about you, but after awhile I start hating everything in my closet. I blame it on the bitter winter and the style rut it puts me in. Day after day it's always the same thing - long sleeve, scarf, coat, and hat. But thankfully the groundhog predicted an early spring, which means we won't have to suffer much longer. But why wait for spring to add a splash of color to our winter wardrobes? 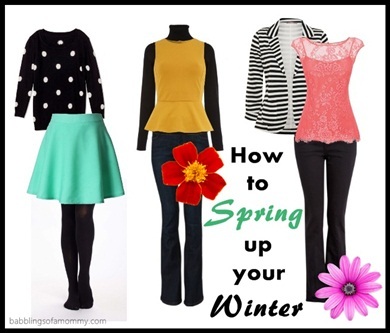 Here are my tips to winterize your spring wear. 1. Bright colors can brighten up and winter outfit. Wear a pastel skirt like the one pictured above and pair it with a fun sweater and some black tights for a cute new look. 2. Don't put away your sleeveless tops. Instead pair them with a black turtle neck to completely change your outfit. Pretty lace tops and delicate florals don't have to be reserved for warm nights, pair them with a blazer and trousers for a sharp seasonal look. Do you like to incorporate your spring clothes during the winter? I try to. I love to wear bright skirts with back top and black tights! Totally do-able ways to add a pop of fun to dreary winter. I busted out my white jeans over the weekend. Just couldn't wait! I love your ideas. Love the idea of wearing a turtleneck under the sleeveless tops! Will definitely try that out (as soon as I unpack them from storage). Here in AZ, we're having spring-like temps today. Wish it would be colder just a little longer -- I enjoy winter woolies. Yes I definitely incorporate my spring into my winter because I am like you and get bored wearing the same winter wear. Great tips. I am the master of thinking how the things I purchase can work for more than one season. I agree a cardigan and a turtleneck are the perfect transition pieces. Great tips..I am always trying to stretch out my wardrobe through different seasons..I am in a closet rut right now as well..just want to ditch it all and start a new with classic pieces with a flare! Loving all three of those looks! Thanks for the tips.. Indeed great choice of latest fashion clothes for the springs..